And an intelligent assistant too? We've been aware of Blackberry's plans to give BB10 an overhaul in the next big update, and a new leak of screenshots shows us what the new UI might look like. We can't verify the legitimacy of these screens, and there's a chance the OS might look a tad different come release, so take all of this with a bit of caution. But from what we can see right now, it looks like Blackberry is jumping on the bandwagon with its own Siri-like intelligent assistant, for one thing. It's also ditched the boxes around the app icons, added a new keyboard layout and colour scheme, and made a few other design tweaks that gives the OS a cleaner, more minimalist feel. As for the camera, the option to record in 720p at 30 fps and 60 has seemingly been added too. However another telling screenshot has surfaced alongside these, showing a set of folders that reveal a 1080x1920 resolution. Again, without delving into the OS ourselves, it's difficult to verify the existance or accuracy of the claim from N4BB. But given that we're not expecting a new Blackberry tablet any time soon, this could well be a hint at a 1080p phone currently in the piipeline. We'll be keeping our ear to the ground. 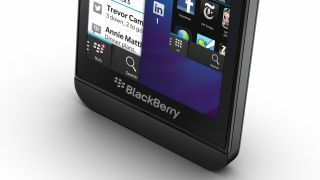 Is the Blackberry Z10 a worthwhile Android/iPhone alternative?